Residents warned me about Marseille. Hold on to your wallet. Hold on to your wife. Given the order of the advice it sounded like a misogynists charter, still I was keen not to prejudge the city. First impressions weren’t favourable. High on an electricity wire I noticed a pair of trainers swinging from their laces and into my mind came a vision of some unfortunate tourist, cowering naked down a back alley. Stripped of all his possessions, he was unable even to hop to the nearest gendarmerie to ask whether anyone had seen his wife. I’d also been warned about the driving. 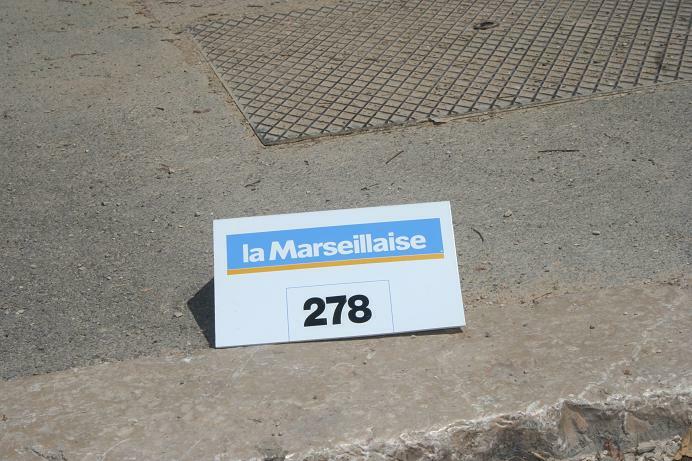 “Remember that famous French film Taxi, where Marseille resembles a Formula One circuit? It’s not fiction, it’s fact.” Sure enough sitting at a set of red traffic lights, the driver of a Renault Laguna, decided to convert his car into an impromptu moped. David Blaine might struggle with this particular trick, but not apparently the locals. The secret is to hit the curb at the right pace and voila four wheels become two. Virtuoso driving like this was apparently quite necessary because stretching the length of the visible corniche was a bouchon (traffic jam) which appeared determined to punch its own personal hole in the ozone layer. Exhaust fumes churned into the still air, obscuring the horizon and suffocating anyone unfortunate enough to be in a convertible – poor darlings. However, at least they weren’t lost and late for a journalistic assignment about the Calanques. Quite literally I’d missed the boat, and so rather than risk permanent damage to my lungs, I left the car on the curb and walked towards the centre of Marseille and the cause of the bouchon. Strung between two trees outside Le Parc Borely was a banner for “La Marseillaise,” which I mistakenly assumed referred to the French national anthem. Streaming underneath the banner appeared to be half the population of the city. TV cameras were everywhere, pretty blonde journalists jabbed microphones in people’s faces and there was a strange smell of aniseed. What had I stumbled upon – a national anthem singing contest? French TV has always been strange but this? Intrigued I allowed myself to be swept along. The first thing I noticed was that the crowd was almost entirely male. The second was that the smell of aniseed I’d detected emanated from the pores of people’s skin. How much pastis did one have to drink to turn into a walking dispenser? Clacking against the over-sized thighs of the crowd, were small cotton bags. They were dainty and wouldn’t have looked out of place dangling from an elegant feminine wrist at the Opera. 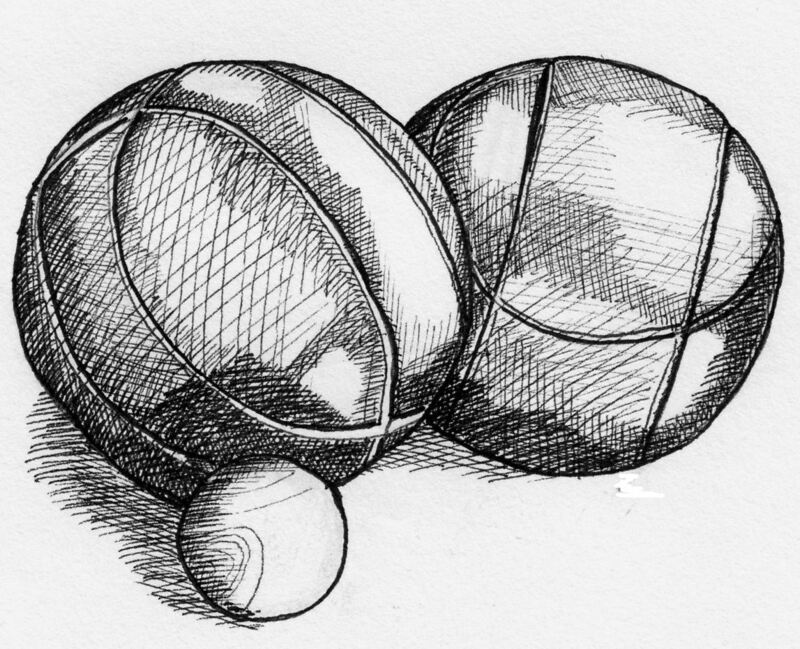 From inside the gates to the park I heard the nerve jangling rattle of metal against metal and I belatedly realised that the cotton bags were to protect the Frenchman’s best friend – his precious boule. 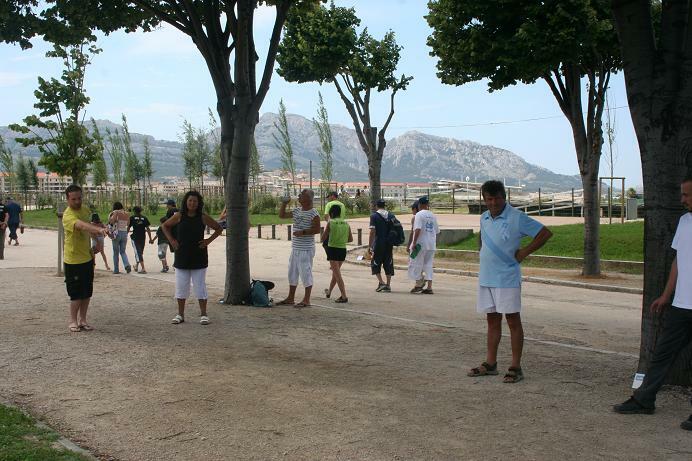 What I’d stumbled upon was a petanque tournament. With little else to do with the day, I strolled through the park. It was still early in the day but most of the players were equipped with half litre bottles of pastis tucked into the pockets of their jeans. Nobody was carrying water so I had to presume they’d drink it neat. Around lunchtime I realised I’d come ill-equipped. While the French opened foldaway picnic tables and chairs I could only dream of the seaside restaurant where I had been booked for lunch. Instead I was forced to watch as terrines, charcuterie and fromage converted otherwise ersatz foldaway tables into temples of fine dining. Wine bottles already had the cork judiciously wedged in the neck, to save the hassle of bringing a corkscrew and to open the bouquet just a little. To fill my stomach I bought a pastis from one of the many temporary bars and much to my surprise discovered a team wearing the livery of St George. Sofiane, Jerome and Herve claimed to be the English national team, and they did so with remarkably straight faces, despite their names. After a chat I discovered they were all working in England, but had, you guessed it, been born in France. Their tip for success in the tournament? “Don’t drink.” Apparently by the middle of the afternoon, most of the locals had had one too many and Stefan said – using a nice English idiom – that even his grandmother would stand a chance. I discovered the best place to watch was the show courts, complete with miniature stands. These were where the professionals in the draw played, with the action being shown live on television. Here the surface was swept and levelled and the intensity level much higher. Defeat at an early stage for these players represented ignominy and it showed. As a spectator sport boule is surprisingly dramatic. There’s an appealing mix of skill and emotion as the participants prowl the playing area, squatting to examine hidden slopes, and then springing upwards into the throwing position. The viciousness of seeing a winning position destroyed in one shot is ultimately what is so compelling. As the shadows lengthened and the sun crept lower in the sky play continued. The games were more boisterous, probably as a result of the pastis, and the music from the hospitality tents – where the star players were housed – became louder and louder. A stilt walker passed me as I headed for the gates. Decked out in garish colours he’d been part of the entertainment thrown on for the great and the good of Marseille. As he wobbled away into the distance it occurred to me that maybe I‘d misjudged Marseille and that the trainers swinging from the electricity wire hadn’t belonged to a tourist after all.